What? Another post so soon? Yes! I continue my epic read-through of Marvel’s Uncanny X-Men comic book series, which started all the way back in 1963. I’m up to the end of 1986 and the very start of 1987 with the very first crossover event for the X-Men titles, Mutant Massacre. Marvel had done events and crossovers before, notably with Secret Wars and its sequel Secret Wars II, but this was the first event where it was mostly centered around a family of titles. Also unique was that there wasn’t a mini-series or other comic released as the main narrative. There are no comic books titles Mutant Massacre, the whole story is told as part of regular issues of ongoing comic book series. It was such a hit that the X-Men comics franchise would refine and recycle this publishing strategy every year for a long time. For a while, it was like clockwork. In some ways, this was the first big step toward the bloated X-Men line with its convoluted interconnected storylines that eventually became impenetrable for more casual readers. It’s the beginning of a slippery slope, but what’s actually here isn’t as bad as what comes of it. Mutant Massacre is well constructed from an accessibility standpoint. Each comic book series looks at their own characters’ perspective of the event and largely stays in its lane. I only read the Uncanny X-Men issues. While it drops in acknowledgements that there are things happening elsewhere (in issues of X-Men spinoff titles X-Factor and New Mutants, and less X-Men-centric titles like Power Pack, Thor, and Daredevil), it wasn’t a disruption and it largely read well. Another peculiarity to this event is that it isn’t clearly branded. In the first part of the event there was a guide of what issues to read but that’s basically all you got. The event isn’t referenced by name on the cover. There’s no “Part 1 of 4” language used anywhere. Even the structure of the plot is somewhat ambiguous in its conclusion. The main action happens fairly early on and the rest is mostly aftermath. There’s no big climactic conclusion, the characters just continue on the best they can. This soft ending is reinforced by some printings of collected editions disagreeing on the final chapter of the event. For the sake of my reading, I’m including Uncanny X-Men #210-214, which matches more recent collected edition reprints. Even though the original promotion for the event had it finishing with 213, I think the whole thing reads better by adding 214. Many events in the future will brag that “nothing will ever be the same again” but before that became a marketing cliche, this event actually did it without really saying it was going to do it. The title’s status quo and cast get seriously altered and won’t really get restored until the ’90s, and in some cases, not until the 2000s. The big inciting incident is that a brand new band of villains called the Marauders slaughters the majority of the Morlocks, the mutant civilization living in abandoned subway tunnels under Manhattan. They’re basically a band of homeless squatters and only some of them have any notable mutant powers to speak of. There’s no real explanation of why, except that the Marauders’ mysterious boss considers them an unknown quantity and wants them removed. Since Storm is supposed to be the leader of the Morlocks, the X-Men go to help. They assist the escape of several surviving Morlocks, and get pretty beat up in the process. They’re followed back to their home, the Xavier school, and are left pretty defenseless. It’s some of the most death the comic has seen so far. Hundreds of Morlocks are seen dead. Wolverine and Nightcrawler were already in poor shape from recent adventures. Colossus and Shadowcat also get seriously injured. 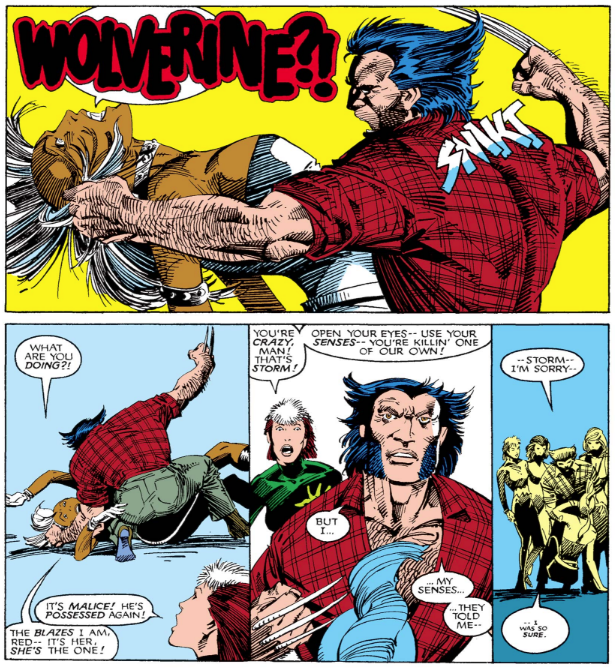 Of course Wolverine heals because that’s what he does, but it’s clear he’s still struggling and not in the best shape. That really only leaves Storm, still with no powers, and Rogue. With half the team decommissioned, the event ends with two new recruits, the British telepath Psylocke and the laser-light generator Dazzler, who after several past recruitment attempts finally joins the team for real. The carnage clearly leaves the characters rattled. Storm seriously considers quitting as X-Men leader due to the losses. She’s talked out of it by her rival Callisto, the previous leader of the Morlocks. Callisto and Storm have had a begrudging respect for each other for some time and this nicely builds on that. I was really hoping that Callisto would join the X-Men. At this point, she’s one of my favorite recurring characters of the series. Storm remains one of my favorite X-Men and she continues to be the glue holding the team together through some pretty rough times. 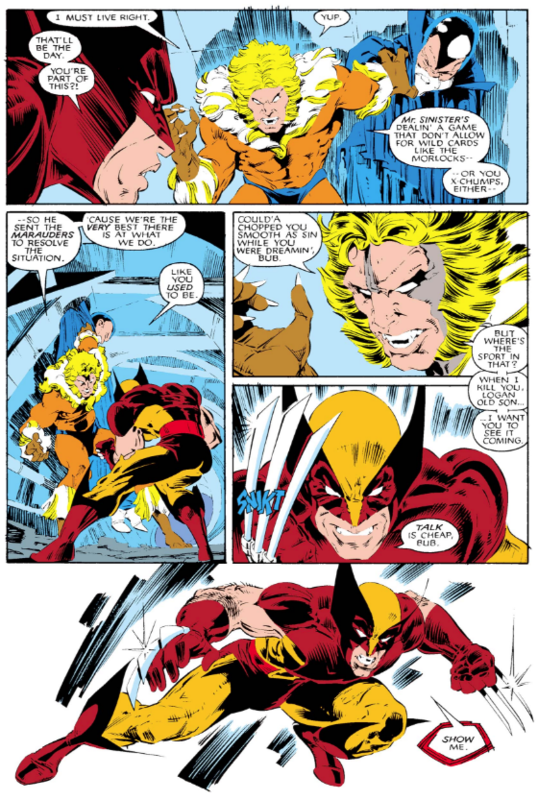 Wolverine finally has his milestone encounter with Sabretooth. They’re establishing as longtime rivals. The mysteries of Wolverine’s past are starting to stack up and it’s a bit obvious in retrospect that they often had no idea what half of this stuff actually meant. Whatever makes him seem cool, just throw it on the pile. From interviews of the time though, we know that Sabretooth was meant to be Wolverine’s father. Some of Sabretooth’s dialogue in these issues makes this pretty clear too. But as with too many of Claremont’s long percolating plots, he never got around to confirming it. After all, he only had 15+ years writing Uncanny X-Men and many of its spin-offs to get around to this stuff. Later writers naturally wanted to put their own stamp on things so they did something different with the hints. Usually this results in retroactively causing some dialogue in the older stories to be a bit discordant with what is to come. It doesn’t outright contradict but it doesn’t quite line up either. Rogue doesn’t seem to do too much in this story, emotionally. She’s around a lot to use her powers but she doesn’t get a lot of character moments. During the initial battle with the Marauders, Shadowcat’s powers are disrupted somehow, causing her to slowly fade away. She eventually can’t even talk and we don’t even get any thought bubbles from her, making it extra creepy and sad. She’s put in some kind of container, although it’s not made clear exactly what it’s supposed to be doing since she could theoretically pass right through it. Nightcrawler also gets seriously injured and ends up in a coma. The two characters, along with Rachel Summers, who was written out in the last set of issues, will all star in the spinoff series Excalibur, although it doesn’t launch for another year. Colossus sadly snaps during the fight and actually kills one of the Marauders. This is one of the most memorable moments of the story and really drives home how grim things are getting in the midst of the massacre. While he makes it out of the Morlock tunnels, it’s discovered that his injuries are actually worse than they seemed and he ends up being paralyzed. He’ll vanish from the series for a time too. Apparently he was also intended to be in Excalibur but during the development of that series, Captain Britain took Peter’s spot as the strong guy. So he’ll eventually return but it’s too bad we don’t get to see him dealing with his actions during the fight. Betsy Braddock is a semi-new character. She was new to American readers, but she first appeared about ten years earlier in Marvel’s UK comics. She gained the name Psylocke in her first US appearance for New Mutants Annual #2, where she is kidnapped and given bionic eyes so she can be an unwitting spy for the extra-dimensional villain Mojo. She hangs around the Xavier school for a few months as everyone, including herself, debates what to do with her. While clearly older than the teenaged New Mutants cast, she’s considered for that team instead of the X-Men. 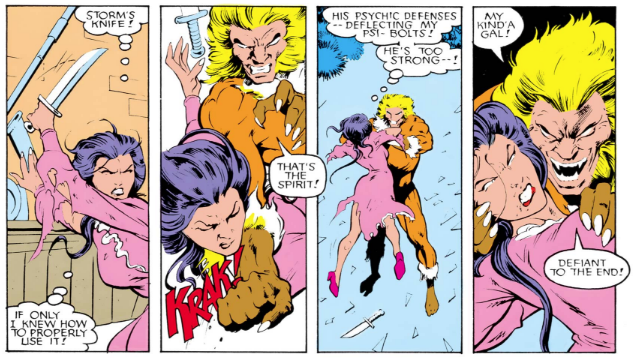 But when Sabretooth invades the mansion, Psylocke proves herself and she earns a spot as an X-Man. This issue was really interesting because I mostly know the character in her ninja guise she’s given later. It always seemed like a random juxtaposition between the two versions of the character, but there are a lot of clues in this issue that indicate Claremont might’ve actually planned the transformation all along. She tries to use a knife in self-defense (she’ll later have a psychic knife), and her own narration has multiple references to her wanting a darker side to her prim exterior. This fight with Sabretooth gets a sequel years later. I’ve read that issue and never knew the characters had a history like this. Dazzler was outed as a mutant a couple of years ago, which ruined her singing career. A subplot in these issues shows her taking a job as a musician in Lila Cheney’s band. 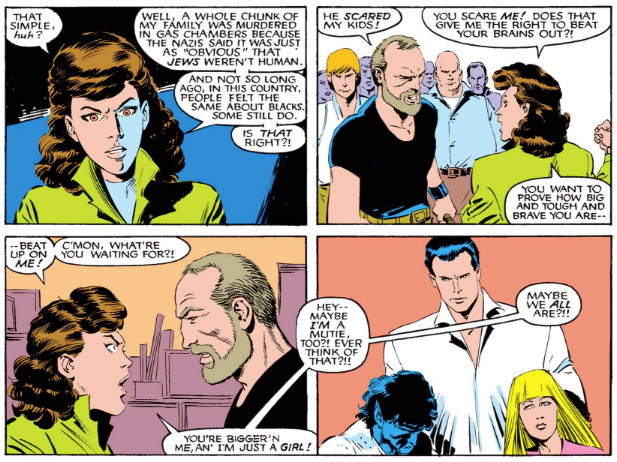 Lila is a character that only had a few appearances in New Mutants up until now. This is her first appearance in Uncanny X-Men and she probably could’ve been introduced a bit better. There’s nothing to indicate that she knows the X-Men until they get a call from her letting them know Dazzler is acting weird. 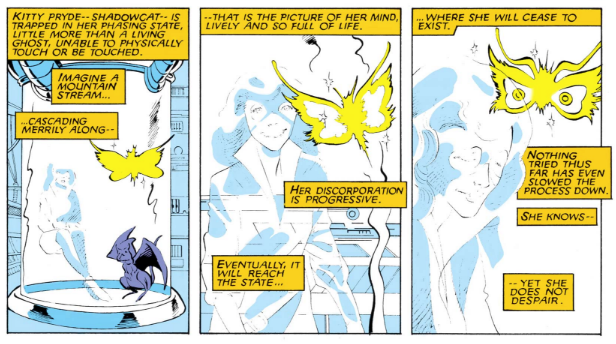 But anyway, what seems like an unrelated incident ends up being another of the Marauders mind controlling Dazzler. They eventually free her but now her career is completely ruined, so without really any other options, she agrees to join the team. Speaking of the Marauders, aside from Sabretooth and the mind-controller Malice, we don’t get a lot on them. They’re obviously brutal but they’re mostly just different flavored foot soldiers serving someone named Mr. Sinister. It seems like most of them are mutants but other than their boss vaguely wanting to get rid of “wild cards,” there isn’t much explanation for why this is all happening. And since this is mostly mutants killing mutants, it’s not really furthering the building theme of the growing anti-mutant hysteria. From what I’ve heard, the original plan for this story was that Nimrod was going to be the main villain slaughtering the Morlocks. This probably would’ve been better thematically. Of course, there was just a big battle with Nimrod, but I assume if the original Mutant Massacre plans held, those issues would’ve played out differently. On the art side of things, it’s a bit inconsistent, averaging one artist per issue. After three years as the main artist, John Romita, Jr. departs. He’ll return to the series in 1993 for another stint, at which point his distinctive style will be firmly in place. Bret Blevins steps in for several pages on Romita’s last issue. He will later show up for a run on New Mutants. Rick Leonardi, who wonderfully handled Cloak and Dagger, does a fill-in. Alan Davis arrives for a fill-in issue as well, and his issue looks wonderful. I wish he took over as the regular artist but his style may not quite fit the darkening tones. Barry Windsor-Smith shows up again for his fourth issue of the series. Although here he only does pencils, the first time he didn’t also handle inks and colors. It was strange to see him hop in on something more conventional but it still looks great. Those are all fantastic artists but their styles vary somewhat, weakening the cohesive unity of the overall story. As w get to later crossover events, this will become more of a problem. Here it seems like Romita was maybe removed from the book before they had a new regular artist in place, causing a bit of a scramble. While the X-Men are trying to rebuild, they are both physically and emotionally battered, both individually and collectively. While there have been harrowing moments and the threat of danger hanging over the series for a long time, this is among the most permanent repercussions they’ve had to face. Half their team is medically unstable, the mansion is serving as both a morgue and trauma unit for the Morlocks, their mutant-detecting equipment Cerebro is beyond repair, and they are in no shape to defend themselves from an attack, which they expect could come from the Marauders any day. In many ways, the series had been coasting on the momentum of the classic John Byrne era of 1978-1981. This seems like the strongest step toward bringing the book into a new era. While I’m sad to see this era of the X-Men end and some of these characters move on, I have to admit some elements were getting a bit tired. Most of the characters getting removed were directionless for awhile, as if Claremont had run out of things to say with them, so it seems like a good move. I’m liking Psylocke more than I expected already. Dazzler I can take or leave so far but we’ll see. This kind of deck clearing is rare in any kind of franchise, so I appreciate the bold move and am excited to see what happens next. ← AMA: What happened to the CrossGen stuff?